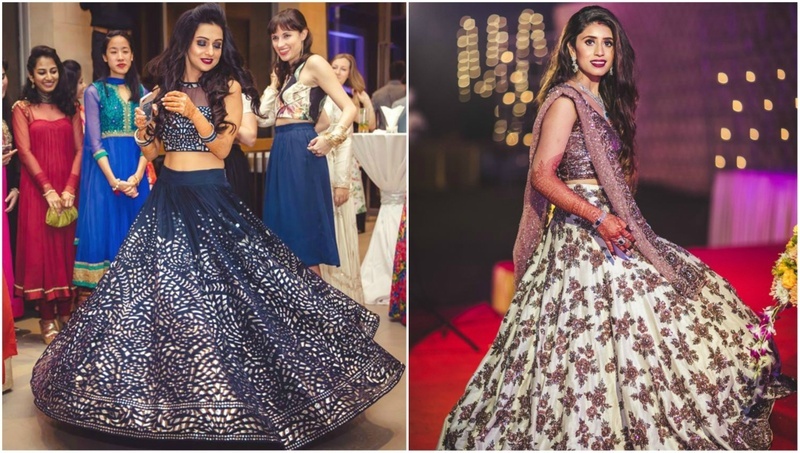 10 Stunning Sangeet Outfits From Real Brides! All Indian ceremonies have a pre-decided color for the bridal outfit, but what you wear for your sangeet function is very much in your control. Now whether you have spent your entire adulthood shying away from the dance floor or otherwise, the chances of you to channel your inner Bollywood diva at your Sangeet night are pretty high. A sangeet function is a highlight of the whole wedding, coupled with some great music, choreography, and an open bar - so, no other event quite matches the liveliness of this pre-wedding ceremony. With the bar being raised that high, it’s expected of a bride to bring her A-game in, when it comes to fashion. Masoom Minawala wore an Abu Jani Sandeep Khosla customised outfit for her sangeet. From its stylish bat sleeves, mirror work, and lotus motifs, everything about it is steal-worthy. This bride turned heads in a gorgeous emerald green Manish Malhotra creation at her sangeet. We love the whole indo-western vibe of this attire with a stunning off-shoulder bodice and the skirt with intricate floral work on it. Nishka Lulla opted to wear this dazzling blue lehenga from the House of Neeta Lulla. If you too are looking to ‘up the ante’ with a refined yet glamorous look, this lehenga with pink motifs on it, is a must-have. Masoom Minawala slayed in a high-waisted grey lehenga skirt and well fitted blouse by Manish Malhotra for her musical night. Unleash your inner diva with this royal blue lehenga which is all about detail and dazzle. It’s beautiful embellishments stand out from the colour of the attire adding all the glitz and glam to it. This orange and red cutwork lehenga with golden embellishments has a very vibrant vibe to it. It’s lightweight, vibrant, fun and will allow you to put your hair down and dance the night away. If you are someone who likes lighter colours then you’ll probably be inspired by this Manish Malhotra creation. It features an assortment of wine coloured motifs on the ivory lehenga-skirt paired with a sequined dupatta and top, making it an ensemble perfect for your sangeet night. This bride wore a mint green lehenga, for her fun filled sangeet night and it’s all kinds of fab. If you are on the lookout for something lightweight, fun and sophisticated too, you should totally check this one out. High on glitz and glamour, this lehenga is for a bride who plans to have all eyes on her. We are crushing over this high waisted lehenga pairing the hues of vibrant yellow and pink beautifully. If all-things-traditional is just not your style then you should think of donning a statement gown for your sangeet. You are bound to fall in love with the whole ‘modern day princess’ vibe of it. So which of these do you think is ‘the one’ for your musical night?